- Clinique Superdefense Daily Defense Moisturizer SPF 20 for Very Dry to Dry Combination Skin in 50ml: Hydration creates a healthy moisture barrier to better resist irritants. There's antioxidants and UVA/UVB protection. All in a light, silky formula that helps prevent the first signs of ageing. Glides on skin, absorbs quickly. 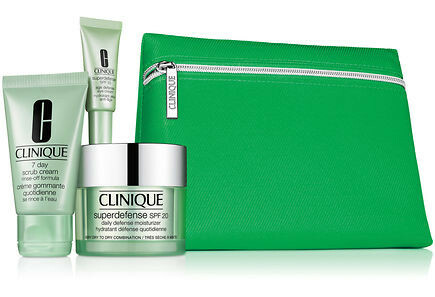 - Clinique Superdefense SPF 20 Age Defense Eye Cream in 5ml: Helps defend eye area from visible ageing. Instantly brightens. All-physical sunscreen for comfort. - Clinique 7 Day Scrub Cream Rinse-Off Formula in 30ml: Skin looks translucent, clearer, brighter. Clinique 7 Day Scrub Cream Rinse-Off Formula de-flakes, polishes, clears pores, refines and helps lessen fine lines. Helps control oil-related problems. Moisturiser absorbs more easily. Gentle; leaves no residue on skin after rinsing.